Loud, sign-waving protesters greeted State Assembly Speaker Carl Heastie Thursday evening as he made his way along Harrison Street to the fundraiser he was throwing at the Tribeca restaurant Terroir. 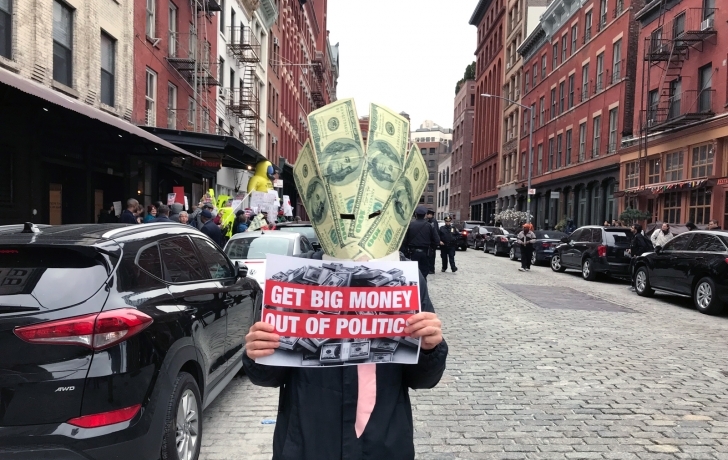 Chanting “We gotta get big money out of politics!” a coalition of groups led by Rise and Resist crowded outside the restaurant where guests paid $500 to $25,000 to the Speaker Heastie PAC for a chance to sip cocktails and shmooze with the powerful Assembly leader. The demonstrators wanted Heastie to hear their demands for campaign finance reforms and other progressive legislation they say have gone unfulfilled by the now Democrat-led state legislature. “Heastie seems like kind of an old-time pol,” said Diane Englander from a group called Indivisible We Stand Upper West Side. Like other demonstrators, Englander called attention to what she complained was the passage of a weak pied-a-terre tax in the recently passed state budget, and a lack of support for small-donor matching funds. The protesters argue the they’ve been let down by Assembly Democrats who had found it safe to support progressive causes when there was a Republican-dominated Senate. “I don’t agree with your assertion that I’m putting big money before people,” he replied. Then asked why he didn’t get the Assembly to pass campaign finance reform, Heastie answered: “I agreed to the same budget as the governor and the state Senate.” Before the demonstrator could follow up, the Speaker was escorted inside to his fundraiser. A spokeswoman for Hastie did not respond to a request for comment.